Arguably the best U23 Hungarian rider, Attila Valter, will join CCC Development Team on a 2-year deal. We’ve had the opportunity to follow his early career quite closely, since we often raced against each other. He was spectacular at Tour of Slovakia, finishing the queen stage, with uphill finish to Strbske Pleso, in 3rd place. He was bested only by Julian Alaphilippe and Ben Hermans and outsprinted our Jan Tratnik. Meanwhile in Tour of Hungary he fought a fierce battle against Patryk Stosz for KOM jersey. At the end of the day, he didn’t defeat our rider, but showed great strength, ambition and aggressiveness, which is something we are looking for – Piotr Wadecki, sport director of CCC Sprandi Polkowice explains. Valter is a current double Hungarian National Champion – as he took both, road race and individual time trial. In the former race, which was held jointly for elite and U23 riders, he was first across the line and only race regulations prevented him from taking the elite jersey. In July’s U23 European Championships he was 9th and in both stage races mentioned by Piotr Wadecki, he finished in the top 15 overall. He is just 20 years old, so there are still two years in U23 category ahead of him and a lot of space for improvement. 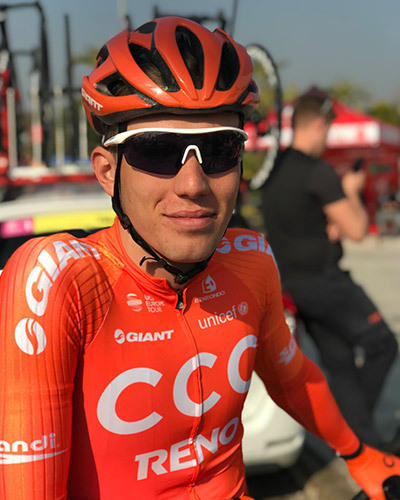 Valter will move to the development “orange squad” from Hungarian Pannon Cycling Team. The day after Tour of Slovakia stage, which I finished on the podium, sport director, Tomasz Brożyna approached me and asked if I have a contract for next year and if I would be interested in joining CCC – says Attila Valter. – For the rest of the day I couldn’t think about anything else and I couldn’t focus on the race. I lost some seconds on that stage and dropped in the overall standings. After the stage Piotr Wadecki called, we talked about the new project and it all sounded very interesting. After the worlds I confirmed to the team that I will sign the contract. I was invited to Polkowice, to the team’s headquarter and I was very impressed with what I saw. I’ve never seen anything like that before. I can’t think of a better team to land with. It’s a well organized squad and I can continue to live in Hungary and finish my degree in Sports Management. I was also given a green light to still do some MTB races, like European Championships or World Cups, so I can qualify for 2020 Olympics in Tokyo.